In the means of providing in-building broadband coverage, primarily LAN is designed known as WiFi, based on IEEE 802.11 specification. This chapter gives the user a basic understanding on WiFi. 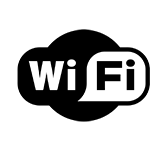 WiFi chapter has been prepared for ameteurs in order to help them get the basic concepts of WiFi. To learn this tutorial one must have a basic understanding of thebasic telecom concepts such as LAN, Duplex, ISPs, etc.